This little monster is busting out of the closet! Do you sometimes think that your little baby girl can be a teeny tiny little terror? Secretly of course, because duh, you're a perfect parent who loves their child. 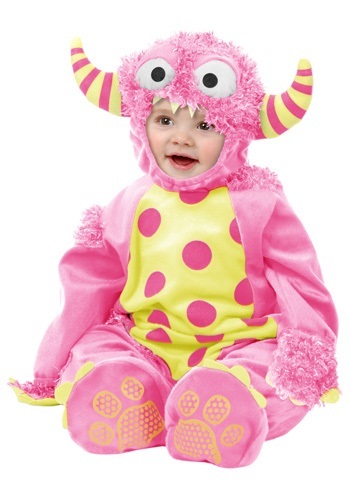 We know that great things often come in small packages, so of course this Infant Pink Mini Monster Costume is perfect! Plus, it's pink, yellow, and polka dotted so she's sure to love wearing it as much as you will watching her crawl around in it. It's a great way to channel your little lady's blooming personality! Sure, monsters are supposed to be scary but it's time to ditch that stigma and show the world just how cute and cuddly they can be! The adorable ensemble includes a furry little jumpsuit, hood, the cutest striped horns, googly eyes and booties all made of soft 100% polyester fleece. Check out our blue mini monster costume for boys so you can have a pair of little boy and girl monsters. If you have some more monsters that aren't so little, don't worry because we carry cuddly monster costumes in toddler sizes as well! You can parade your whole gang around the block, collecting crazy amounts of candy in the cutest monster costumes around! That's what Halloween is all about, right? We know that not all little girls what to be princesses so switch it up this year and pick a costume that's sure to make a statement, a very cute yet ferocious statement!